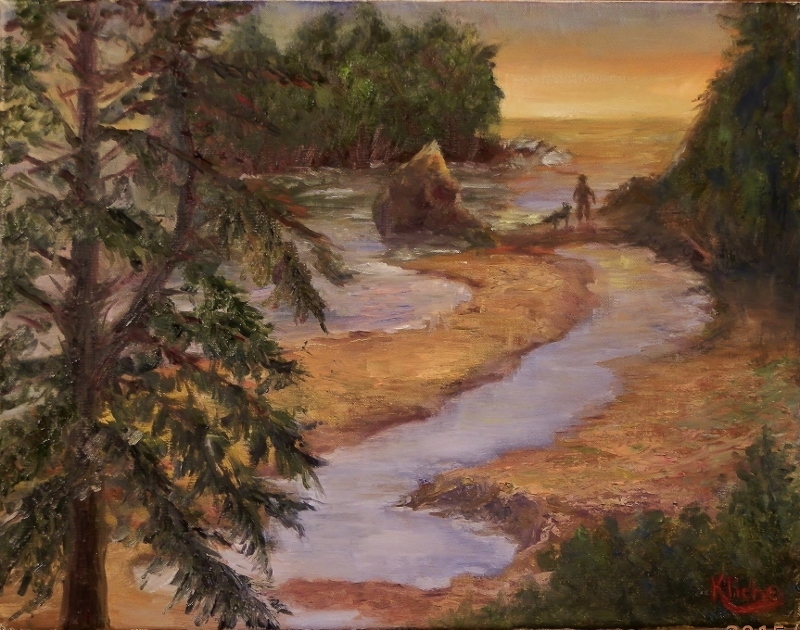 To view this episode of “Painting Journeys”, click on the highlighted title of the painting, “Shi Shi Beach”, or go to http://www.wscssheboygan.com. Go to VOD (video on demand), select the playlist “Painting Journeys.” “Shi Shi Beach”, Washington. While driving along a backwoods road in Cowlitz County, visiting my sister in Washington State, I came upon “Mill Creek“. 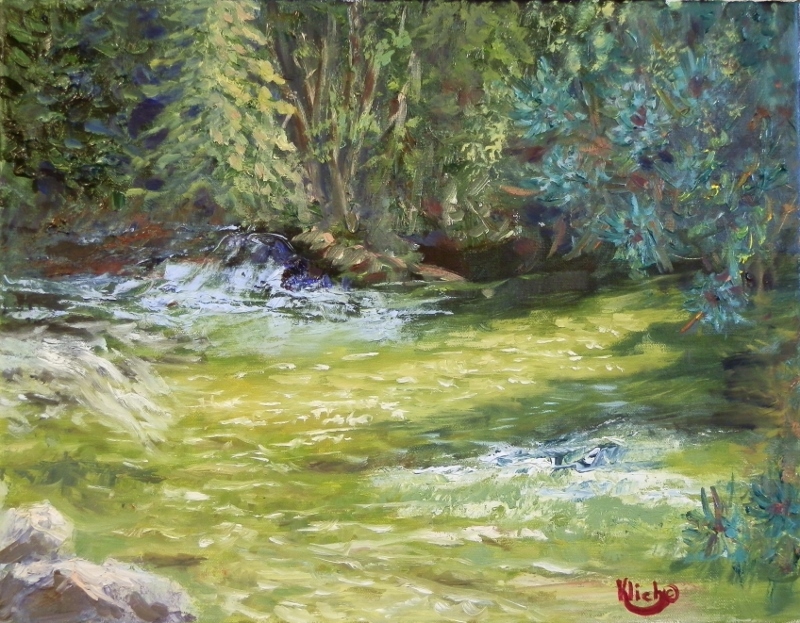 The way the sun was shining through the evergreen trees onto the cool, clear water rushing over the rocks, I was compelled to capture that beauty on canvas. There is something so purifying to my soul when I am able to see nature at its most untouched. The water was clear and I could see fish lazily swimming by, where it had been warmed by the sun. Shafts of sunlight changed the color of the trees to a bright golden green. Hmmm, so beautiful. . . .
To view this episode of “Painting Journeys”, click on the highlighted title of the painting, “Mill Creek”, or go to http://www.wscssheboygan.com. Go to VOD (video on demand), select playlist for “Painting Journeys” “Mill Creek”, Cowlitz County, Washington State. I had a friend (she has since passed on) who was from Europe. She also, a painter, searched far and wide for photos of animals and places from her home country of Belgium. She would always tell me that the sheep in America did not look like the sheep in Europe. 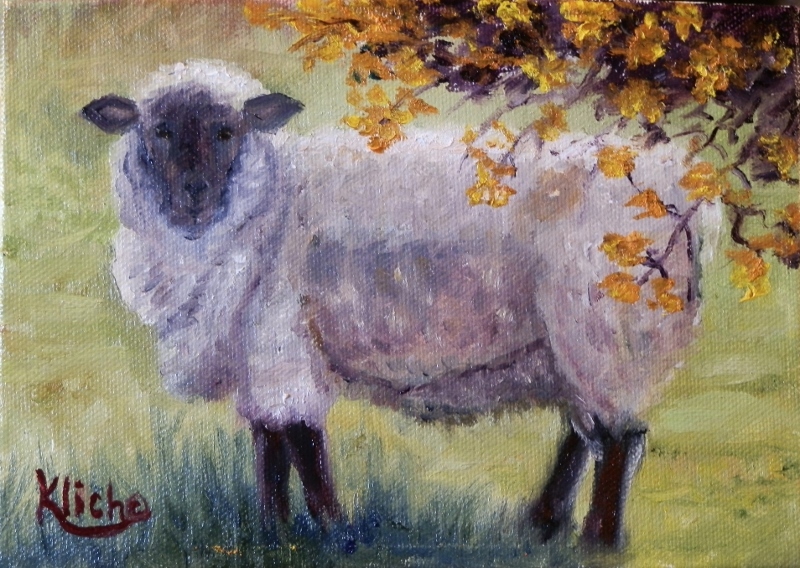 When I arrived in Ireland, mistakenly thinking that there would be sheep everywhere because the Irish are famous for their knitted woolen goods, I was very surprised that I did not see any. There were plenty of cows, but no sheep, much to my consternation. I had been in Ireland almost a week and had traveled to many different areas before I finally came across this beautiful boy. He stood still, as if posing, while I took the photographs that I would need to complete this portrait of “Irish Wool”. One of the things that intrigued me most during my trips to Ireland was how the feel of the landscape was so varied. You would be driving past beautiful, modern looking homes and right there in the middle of them would sit a quaint farm. In the painting “Days Gone By” I wanted to capture the charm of these places that had stood for so many years. I could sense that the walls held many stories (the Irish are great story tellers) and I wished there was some way, something more than by just painting them, that I could try to interpret those stories. But, I am a painter and I tell my version of the stories on my canvas. To view this episode of “Painting Journeys”, click on the highlighted title of the painting, “Days Gone By”, or go to http://www.wscssheboygan.com. 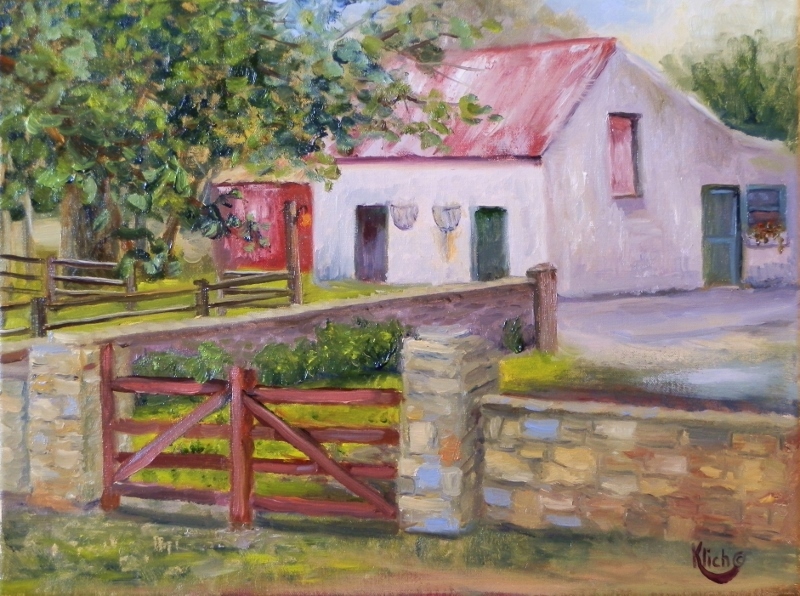 Go to VOD (video on demand), select playlist “Painting Journeys” “Days Gone By”, County Claire, Ireland. Each year the Oil Painters of America, a national organization for artists that paint in a representational style with oils, hosts Paint Outs all over the United States. As a member I had the wonderful opportunity to attend an OPA sponsored paint out in Denmark, Wisconsin last fall. Our host, Molly Johnson, owner of the Academy of Fine Art in Denmark, was very gracious and welcoming. It was a cold and rainy day and we would run in and out to get warm and dry off in front of the big fire in an oversized wood stove she had in the comefy lounging area for the artists. 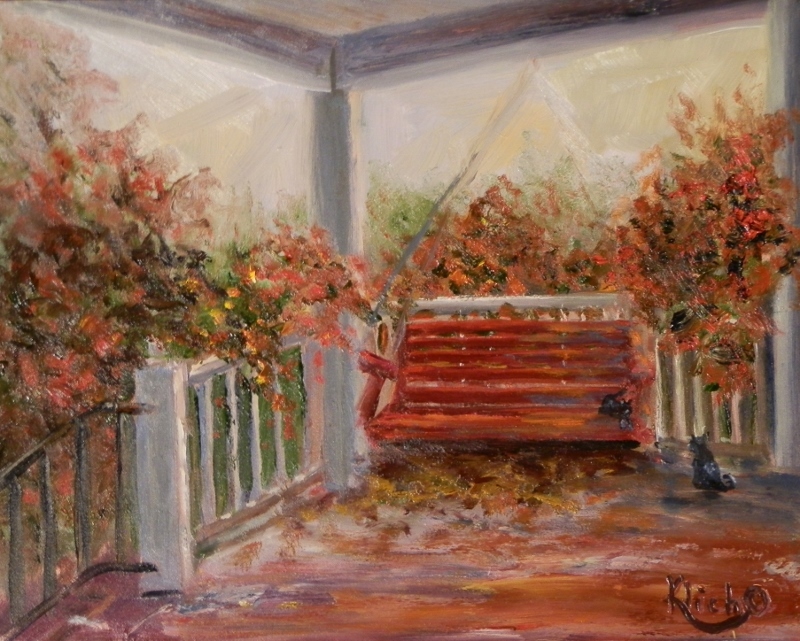 I painted on the front porch of her house, to keep out of the rain, and her adorable cats kept me company as I rendered the porch swing, all surrounded with beautiful bushes in all of their autumnal splendor, unto my canvas. Northern Wisconsin is a beautiful place to visit any time of the year, but in the fall it is gorgeous. “The Colors of Autumn” are so vivid and the clean smelling air is very refreshing. I had come to visit the Apostle Islands. After a wonderful and informative day on the lake touring the islands I thought I would stop for dinner. Quite by accident I stopped by what turned out to be the oldest restaurant in Bayfield. I was delighted to see all of the history, as the walls were covered with photographs, all autographed, of big movie stars from the 1940s through the 60s. What fun and memories of great movies I had seen years ago. 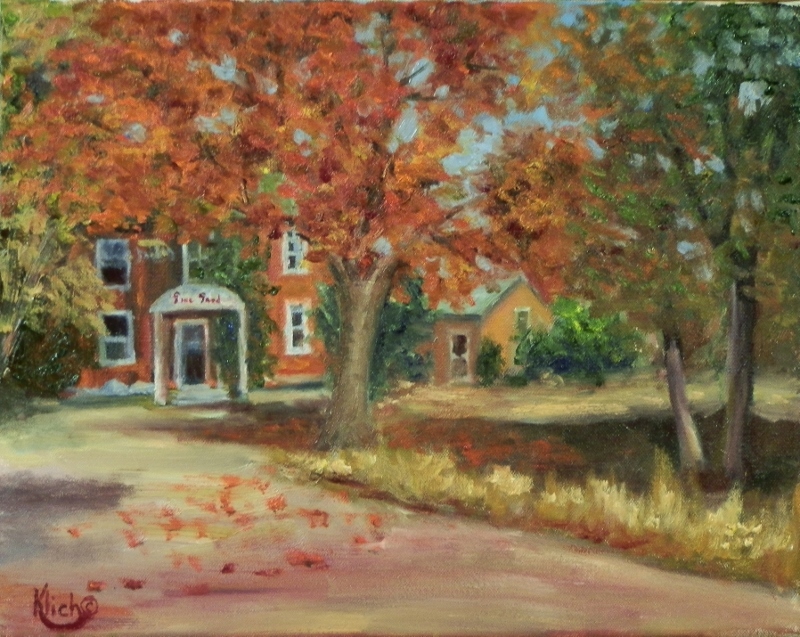 To view this episode of “Painting Journeys”, click on the highlighted title of the painting, “The Colors of Autumn”, or go to http://www.wscssheboygan.com. Go to Programming, scroll down to VOD (video on demand), select category “Arts, Music & Entertainment” and then scroll the shows for “Painting Journeys” “The Colors of Autumn”, Bayfield, WI. While traveling through Ireland I stayed in one place and took day trips to the various locations I wanted to visit. I visited lovely little hideaway villages as well as enormous castles in larger cities. A most welcome sight though, every morning, as I came out to board the bus that would take me to that day’s adventure, was this huge old tree. 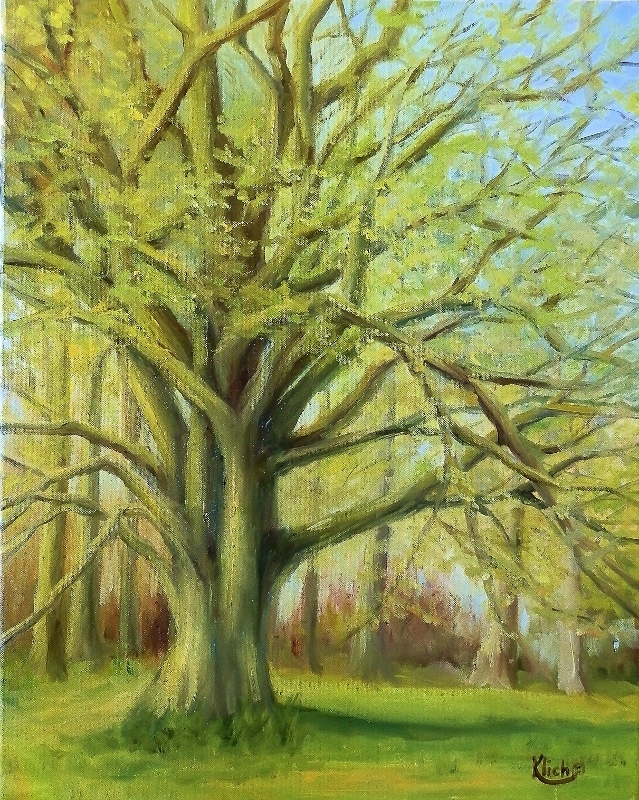 To me it was one of the most beautiful trees on the grounds of the manor. Early in the morning the sun would sift through the mist and bathe the tree in warmth and beauty.